I’ve been hearing from you and from my husband about how you are enjoying my blog. I’m humbled, really. My intention was never to bring attention to myself, but only to share my love of cooking, particularly baking. I’m glad that you are getting a small glimpse into our lives, my life. I’m not gonna lie…It’s been a rough couple of days. There are just some times that I can actually feel the fingers of depression choking me, holding me down until I don’t want to breathe. It’s really scary, actually. This week has been one of those weeks. It always seems to get the better of me when the kids have been sick, and the weather is bad and I can’t get out of the house and then everything seems so overwhelming. There’s more laundry, more dishes, more meals, and on and on. Then I begin to think, “What’s the point?” It’s all too much….so I just go back and lay down with Clark while he watches cartoons. Sleeping and watching t.v. helps me forget about the present. I’ve got a great husband, though. He told me just get some sleep this morning and got the kids ready and off to school. Then he called me around lunch and said, “I want to take you to get a taco. Let’s get you out of the house.” It’s just what I needed. He’s always what I need…. Even though it’s cold and rainy and dreary outside, the fresh air and the walk around Target did me some good. I already feel better. Not so overwhelmed. The fingers are loosening their grip. This pizza came out so pretty, I had to share a picture of it! 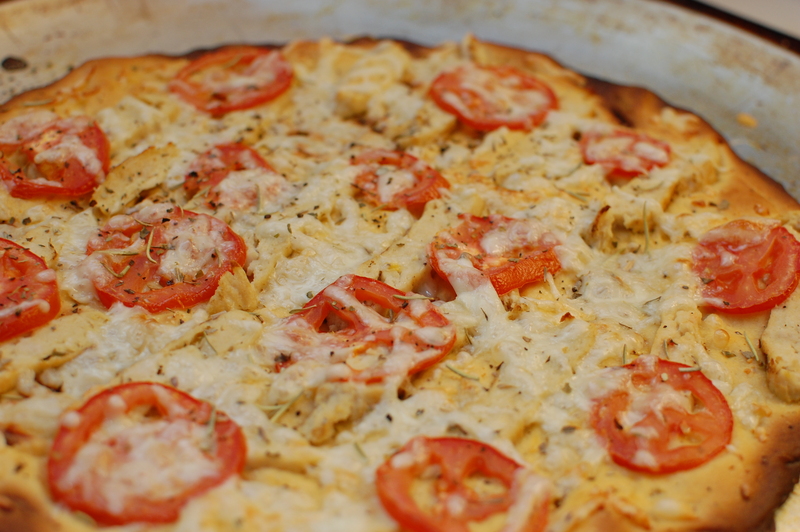 I made something a little different for me and Mike: Chicken and Tomato; the kids still had pepperoni and cheese, as always. Since tonight is Pizza Night and I’ve already posted my pizza dough here, I’m going to share this recipe tonight. 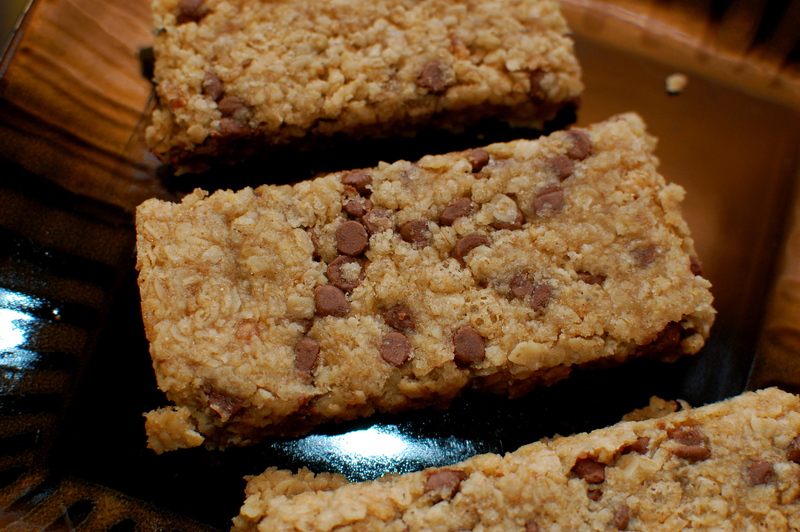 My kids love granola bars, especially for their snacks at school. Preheat oven to 350 degrees. Grease a 9×13 pan. In your mixing bowl, combine butter, peanut butter, corn syrup, and brown sugar and vanilla. Next add cereal, oats, flour, wheat germ and chocolate chips – mixing well after each. Press dough firmly into your pan. Bake for 10 minutes. Remove from oven and carefully press down dough again (this makes sure that the bars are not crumbly). Bake for another 10-15 minutes, or until golden brown. Cool for at least 10 minutes before cutting. Soooo yummy! I think they’re even better the next day! 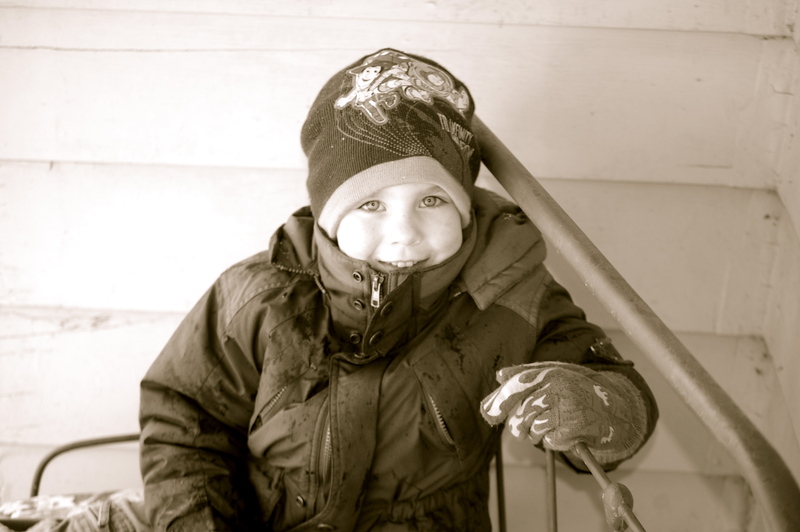 And this lil’ guy whom we call Dooser, because he’s always “doing” something, was taking a break from shoveling snow 😀 He’s been sick for the last 3 days and so he told me he needed to work! i’m for sure gonna try those granola bars! they look so yummy!! on February 6, 2010 at 5:52 am | Reply Meghan A. Look so awesome! Love your new site, too, by the way. Ok, now for my question. I am allergic to peanut products. Any variation for granola bars without the peanut butter? The original recipe I found actually didn’t call for peanut butter. Just increase the butter to 2/3 c and omit the peanut butter! Easy!